If you haven’t gone through last week’s tutorial, I highly encourage you to do so before continuing with this post (you can read it here). In today’s tutorial, we will get to do some of the more fun stuff! Now that we’ve gotten the hardware up and ready, let’s get working on the firmware to fully implement the project. In our project, we mentioned that we have one custom service and two custom characteristics. The first step in any custom GATT design is assigning UUIDs to each custom service or characteristic. In BLE, user-assigned UUIDs are always 128 bits. The easiest way is to use an online GUID generator like https://www.guidgenerator.com/ (or you could simply assign a manual UUID). 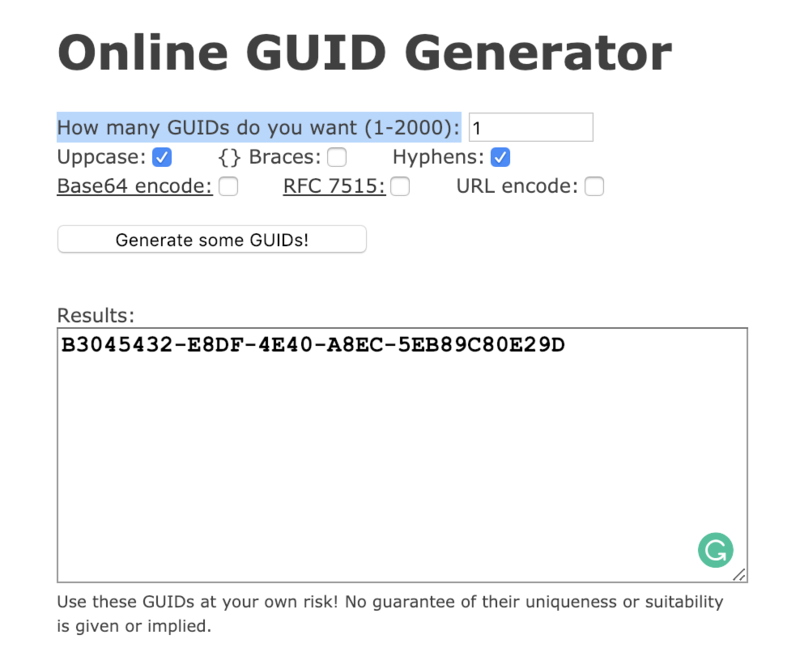 Once you have the GUID generator website launched, check the Uppercase option, enter 1 in the field “How many GUIDs do you want (1-2000):”. The reason we will be generating only one UUID is that we can use it as a base and increment specific bytes within it and assign the services and characteristics accordingly. It also makes it easier to relate a specific characteristic to another one and to the parent service associated with this characteristic. This also makes it easier to work with within the nRF5 SDK, since it requires custom (also called vendor-specific) UUIDs to be added in two parts: a base and an offset. This will make a lot more sense when we go over the source code for adding the custom UUIDs. Now that we have the custom UUIDs assigned, it’s time to define the permissions for the different characteristics. The main aspects we’re concerned with are: Read, Write, Notifications, Indications. We need to be able to write to this characteristic in order to turn on and off the LED. This is optional for us, but it would be nice to be able to read the status of the LED (on vs. off), so we will enable it. We do not need any notifications since, per the system operation, we will only be controlling the LED from the client side (Central side). Not needed for the same reason we do not need Notifications. It does not make sense for us to enable writes for this characteristic since the button changes status based on local physical contact at the server. We want to be able to read the status of the button (whether it’s pressed or released). We want to be notified at the Central side whenever the button is pressed and whenever it’s released. Not needed in this case since we have Notifications enabled. The next step is for us to implement the application in firmware. Full source code is available for download at the bottom of the post. Click here. Note: Make sure you go through the software requirements and installation steps in the previous post: Prototyping BLE apps on the nRF52840 USB Dongle (Part A) before continuing with this tutorial. Let’s start with the implementation of the service, which we’ll call Simple Service. Let’s go through each line of the header file for our Simple service. First, the usual conditional #define needed to avoid duplicate #include of the same header file. #include <stdint.h> #include "ble.h" #include "ble_srv_common.h"
The following source code is used to define a macro that can be used to instantiate the Simple service. 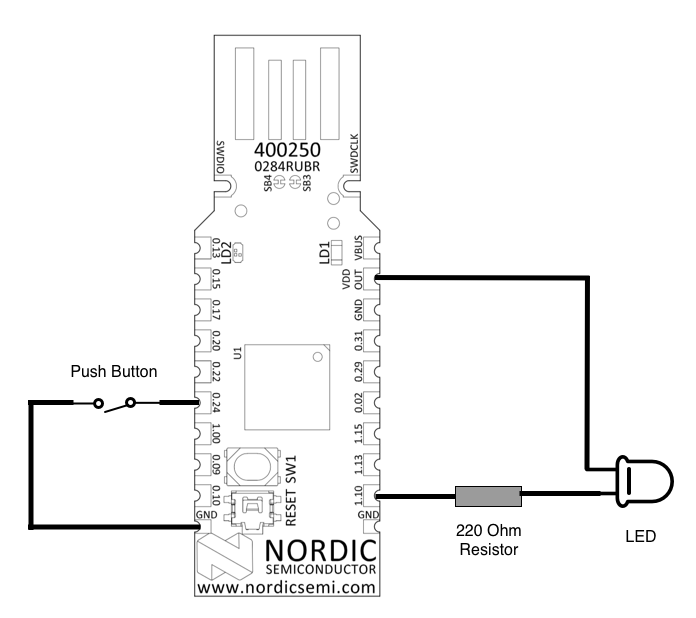 This technique is implemented by other BLE services that are included in the nRF5 SDK. One of the benefits is that allows the application to instantiate the service and not have to worry about handling the BLE events manually (since the event handler gets assigned in the macro and the SoftDevice passes the BLE events back to this event handler). The following defines the base UUID and the offset we mentioned earlier. We use the same base for the service and the two characteristics to make it easier to add the UUIDs to the SoftDevice database. Notice that the bytes within the base UUID need to be listed in reverse order since they are stored in little-endian format. Little Endian means: the least significant byte of the data is placed at the byte with the lowest address, and so on. Next, we define the events that we want to report back to the application. These events are ones that we need to act upon at the application level. For example, to turn on/off an LED or record the occurrence of an event (such as in the case of notifications being enabled/disabled). It is good practice to leave these kinds of decisions and actions to happen at the application level. We want to have the service be as dumb as possible so that it can be reused by other applications without having to change the service’s implementation. The following is a definition for a custom data structure that will hold an event tied to a specific connection (via the unique connection handle variable conn_handle ). We use forward declarations such as the following to be able to reference a custom type before its implementation. In this case, the type ble_simple_service_t is referenced by the upcoming event handler function before ble_simple_service_t is fully defined. // Forward declaration of the simple_service_t type. The following is the prototype definition for the Simple service event handler function. The following is the definition of the initialization data structure used by the application to initialize the Simple service. It contains a pointer to an event handler function that gets implemented at the application level to handle the custom events we defined in the enum ble_simple_service_evt_type_t above, a value to hold the initial LED state, a value to hold the initial button state. Here we define the main Simple service data structure that holds information such as the connection handle, the service handle, application event handler, UUID type, LED and Button characteristic handles. The following is the function used by the application to initialize the Simple service. It takes in two arguments: a pointer to a Simple service object (which gets instantiated by calling the BLE_SIMPLE_SERVICE_DEF macro) and a pointer to the initialization data structure. The following is the event handler function that is referenced by the macro BLE_SIMPLE_SERVICE_DEF and is the function that gets called by the SoftDevice to report any relevant BLE events. Lastly, we define the function that is used to update the Button state characteristic value. This function also handles sending a notification to the Client if it has subscribed to Notifications. We end the file by closing out the conditional #define for the header file. Now, let’s go over the implementation of the Simple service in the source file simple_service.c. First, we include the necessary header files, and most importantly simple_service.h. #include <string.h> #include "nrf_log.h" #include "ble_conn_state.h" #include "simple_service.h"
Next, we define the strings for the two characteristics: the LED characteristic and the Button characteristic. The following two functions handle assigning and clearing the connection handle depending on whether a connection was established or lost. /**@brief Function for handling the Connect event. * @param[in] p_simple_service Button service structure. /**@brief Function for handling the Disconnect event. * @param[in] p_simple_service Simple service structure. A Write to CCCD of the Button characteristic, which indicates enabling or disabling Notifications. A Write to the LED characteristic value, which causes the LED to turn on/off. In both cases we need to report the event back to the application level by calling its event handler p_simple_service->evt_handler(). /**@brief Function for handling the Write event. // CCCD written, call application event handler. The following is the function used to add the LED characteristic to the Simple service. Setting the permissions on the Attribute (enabling Writes and Reads). Notice that both Notifications or Indications are not enabled. Setting the User Descriptor to a human-readable string “LED State”. Defining the UUID for the characteristic (using the base UUID and offset). Assigning the initial value of the LED state. Finally, adding the characteristic object to the database. /**@brief Function for adding the LED characteristic. The following is the function used to add the Button characteristic to the Simple service. Setting the permissions on the Attribute (enabling Reads and disabling Writes). Setting the CCCD permissions to enable both Write and Read permissions. Enabling Write permission on the CCCD enables Notifications or Indications. Specifically, only Notifications are then allowed via the char_md.char_props.notify = 1; assignment. Setting the User Descriptor to a human-readable string “Button State”. Assigning the initial value of the Button state. /**@brief Function for adding the Button characteristic. The following is the function that allows the application to initialize the Simple service and add it to the database. Defining the UUID comprised of the base UUID and the offset. Calling the functions to add both the LED and Button characteristics. The following function is the event handler that gets called by the SoftDevice whenever a relevant BLE event needs to be reported to the Simple service. The following function handles sending a Notification with the Button state value to a Client that has subscribed to these Notifications. /**@brief Function for sending notifications with the Button state value. * @param[in] p_hvx_params Pointer to structure with notification data. * @param[in] conn_handle Connection handle. * @return NRF_SUCCESS on success, otherwise an error code. The last function in this file handles updating the Button state characteristic value. This gets called from the application level whenever the button gets pressed or released, but only if the Client (BLE Central) has enabled Notifications. Updating the database with the new value that’s passed in. Calling the function that handles sending Notifications and passing it the updated value. // Send value if connected and notifying. // Try sending notifications to all valid connection handles. For the main.c source code, we will focus on the implementation specific to our project and leave out the parts that are common to BLE peripheral applications. Of course, the full source code is available for download and includes all the code and project files needed to build it and flash it yourself (you can download the full source code from here). Now let’s go over the relevant source code. First, we make sure to include the header file for the Simple service. // Include the simple service header file #include "simple_service.h"
We modify the Device Name that’s used in the Advertisements to make it easier to find our device. Next, we define the macro to be used for our external button which is connected to Pin 0.24. The Button detection delay is needed by the App_Button module to determine when button presses occur. The internal LED which indicates connectivity (flashing when advertising/not-connected and solid when connected). This is the Green LED onboard the USB dongle. The external LED which is controlled via the LED characteristic as part of our custom Simple service. This LED is connected to Pin 1.10. The timer defined below is needed for flashing our internal LED (aka Connectivity LED). Every time the timer gets triggered, we switch the state of the LED (on –> off and off –> on) causing the flashing effect. This call instantiates the Simple service object. We use a variable to hold the state of the Notifications (whether enabled or disabled). This helps us avoid calls to send Notifications when they are not enabled (subscribed to) by the Client. Initializing the Timer module and creating a timer to handle the Connectivity LED flashing operation. The Connectivity LED timeout handler (to invert the LED state). /**@brief Function for the Timer initialization. * @details Initializes the timer module. This creates application timers. This is the event handler function that gets passed during the initialization of the Simple service. Button characteristic value Notification enabled. In this case, we set the m_button_notification_enabled variable. Button characteristic value Notification disabled. In this case, we reset the m_button_notification_enabled variable. LED characteristic value written to turn On LED. In this case, we reset the GPIO assigned to the LED (LED active state is 0). LED characteristic value written to turn Off LED. In this case, we set the GPIO assigned to the LED (LED active state is 0). The following function is used to initialize the services in our application. We only have one service, the Simple service, so that’s the only one that gets initialized. As part of the initialization, the event handler is assigned and the initial values for both the Button and LED states are set. /**@brief Function for initializing services that will be used by the application. // Initialize Queued Write Module. In the Advertising event handler function, we toggle the state of the Connectivity LED to start flashing when Advertising starts (by starting the corresponding timer). /**@brief Function for handling advertising events. * @details This function will be called for advertising events which are passed to the application. * @param[in] ble_adv_evt Advertising event. In the main BLE event handler function, we handle a few events. Of importance are the Disconnected and Connected events. Disconnected event: we clear the m_button_notification_enabled variable. Connected event: We stop the flashing timer, turn on the Connectivity LED, and clear the m_button_notification_enabled variable. * @param[in] p_ble_evt Bluetooth stack event. // LED indication will be changed when advertising starts. Here we have the function responsible for initializing the LEDs. We use the BSP module for the onboard LEDs and configure our external LED via the nrf_gpio APIs. We also clear the external LED (turn it off) by setting the GPIO pin to 1 (since the LED is active state 0). /**@brief Function for initializing buttons and LEDs. We also define a function for handling the Button events. If the connection handle is valid, the button was pressed/pushed, and Notifications are enabled, then we update the button characteristic value with a value of 0x01. If the connection handle is valid, the button was released, and Notifications are enabled, then we update the button characteristic value with a value of 0x00. /**@brief Function for handling events from the button handler module. * @param[in] pin_no The pin that the event applies to. * @param[in] button_action The button action (press/release). The last function we want to look at is the function for initializing the buttons. In this function, we create an array to hold the buttons we’re interested in initializing. In our case, we are only interested in initializing our external button. In the initialization, we also pass in the delay that we defined at the top of the source file. Finally, we call the a pp_button_enable() API to enable the buttons. /**@brief Function for initializing buttons. //The array must be static because a pointer to it will be saved in the button handler module. Full source code available for download at the bottom of the post. Click here. 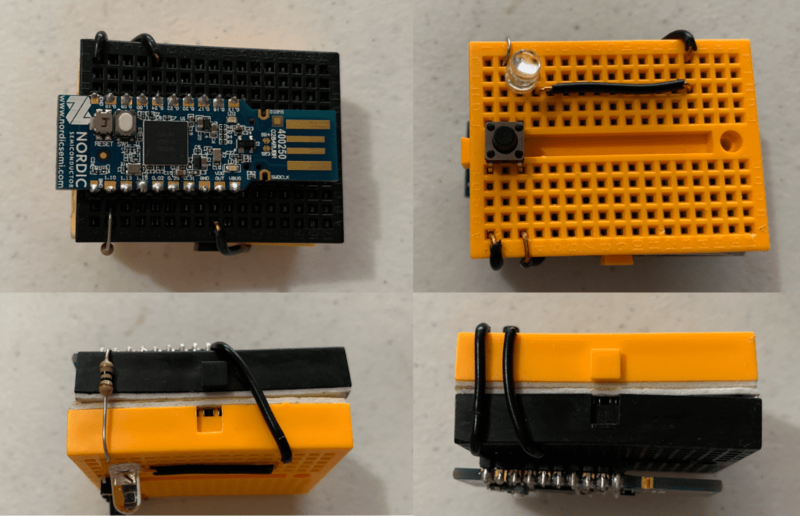 We covered the complete steps to build and flash the firmware to the nRF52840 USB Dongle. You can find the complete steps here: Building and Flashing the Firmware to the Dongle. 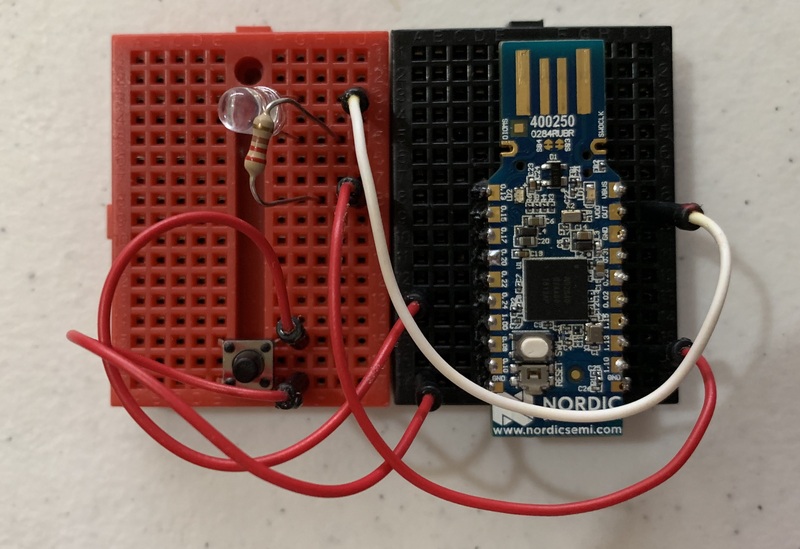 This concludes our implementation for a simple project using the Nordic Semiconductor nRF52840 USB Dongle. If you found this tutorial useful then please share with others and let me know your thoughts in the comment section below. …and don’t forget to enter your email below to get access to the full source code and be notified when the next tutorial goes live! If you would like to download the code used in this tutorial, simply enter your email address in the form below. 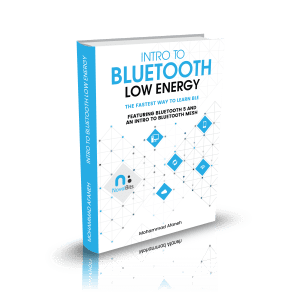 You’ll get a .zip file containing the complete source code, and I will also send you a FREE Report on the Essential Bluetooth Developer Tools. In addition, you will receive a weekly newsletter covering the top BLE news and get notified when the next tutorial gets published. Very usefull tutorial I passed ever. Thanks, Kamil! Glad you liked it. hi, what should I do with the three codes main.c / simpleservice.c and simple_service.h ? Did you get round to a BLE central project based on the 840?